American life expectancy has consistently lagged behind that of other developed nations. But the gap is projected to grow even more by 2030, according to a new study published in the Lancet. Researchers from the Imperial College London and the World Health Organization mapped out how long people are expected to live throughout the world based on a variety of epidemiological and socioeconomic factors. 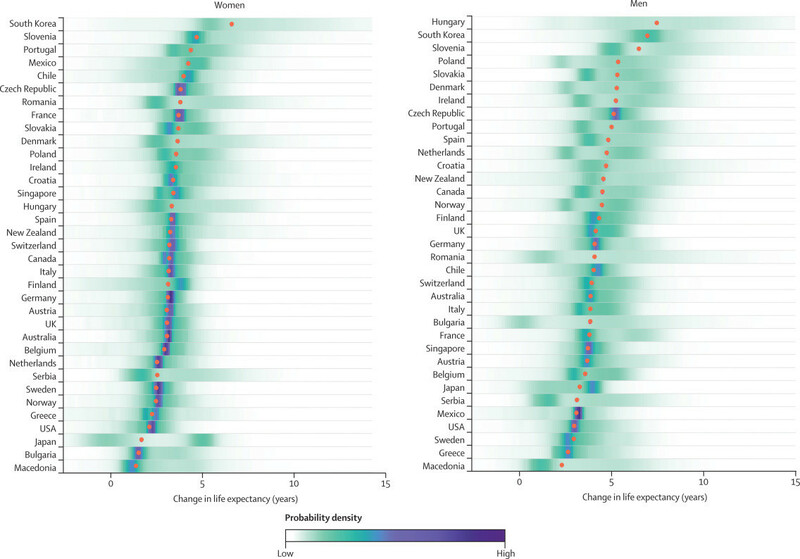 While they found that life expectancy in the U.S. would improve to 83.3 years for women and 79.5 years for men by 2030, other countries will be in a far better position. For instance, South Korea - the nation which tops the projections for life expectancy - will have women living to an average of nearly 91 years and men who survive until 84.1 years in 2030. In effect, that means that the average South Korean will live for six more years than the average American at that point. So why the discrepancy? The study authors listed a number of reasons, including U.S. health care policy (a lack of universal coverage and less robust safety net compared to most other countries) and persistent cultural issues such as high obesity and murder rates in America. "The USA has the highest child and maternal mortality, homicide rate, and body-mass index of any high-income country, and was the first of high-income countries to experience a halt or possibly reversal of increase in height in adulthood, which is associated with higher longevity," wrote the study authors. The projections could be off considering how hard it is to predict socioeconomic changes that may come over the next 15 years. But modern day data also highlights the problem. For instance, the most recent Centers for Disease Control longevity report found that U.S. life expectancy actually dropped for the first time in more than 20 years in 2015 (78.8 years on average). The only top 10 killer of Americans where the survival rate increased that year was for cancer, which has seen a flurry of interest from the biopharma industry.